The protests began peacefully on Friday over an ex-officer's acquittal. As St. Louis braces for a fourth night of demonstrations, the final arrest total in the city from the protest that began on Sunday night over last week’s acquittal of a former police officer involved in a 2011 shooting of a black motorist rose to 123 people, the city’s police said Monday evening. After three nights of protests, more than 160 people have now been now arrested, as police have been aggressively arresting more people to curb property destruction and police assaults. The protests began peacefully on Friday after St. Louis Circuit Judge Timothy Wilson found Jason Stockley, 36, not guilty of first-degree murder and armed criminal action. On Dec. 20, 2011, the then-police officer shot 24-year-old Lamar Smith five times after a high-speed chase and crash. 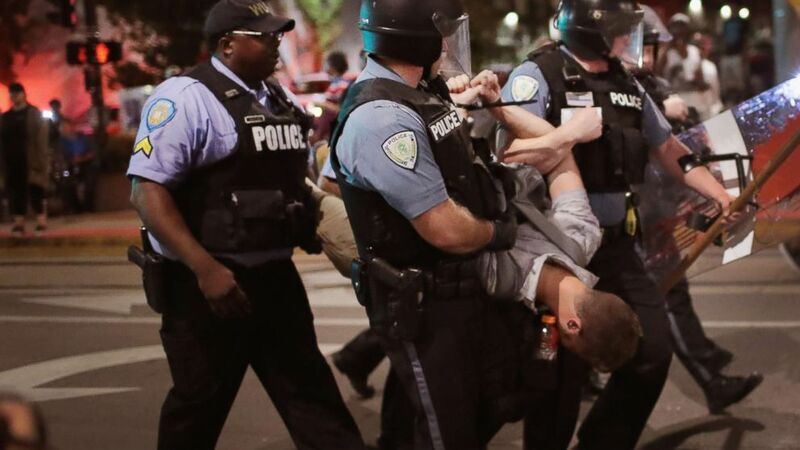 Police said the demonstrations were “no longer peaceful” as of late Saturday night, and five weapons were confiscated, according to the St. Louis Police Department. At least 32 people were arrested earlier in the weekend as demonstrators blocked highways, damaged property and threw rocks at the mayor's house and bricks at police officers, police said. “People setting out do damage are being arrested and these criminals we've arrested should be held accountable and prosecuted to the fullest extent of the law,” St. Louis Interim Police Chief Lawrence O’Toole said in a early-morning briefing on Monday. “We're in control. This is our city and we're going to protect it,” he added. An unidentified chemical was thrown on police officers and a bicycle officer was transported to the hospital with an leg injury Sunday night, police said in a statement on Twitter. The department also tweeted images of knives, guns, masks and other types of protective gear from a “rioter” who police said was arrested. The weekend protests were mostly peaceful, according to the city's mayor, but police said “groups of criminals” were “creating chaos,” breaking windows and causing significant property damage in the city’s downtown area Sunday night. (Scott Olson/Getty Images) Police arrest a demonstrator protesting the acquittal of former St. Louis police officer Jason Stockley, Sept. 16, 2017, St. Louis. After Sunday's demonstrations, the organizers announced that the daytime protests had concluded, but "a group of agitators stayed behind, apparently intent on breaking windows and destroying property,” according to Krewson. Earlier, organizers of the peaceful protests said they were frustrated with the demonstrators getting unruly at night who they say could make it harder for them to to spread their nonviolent message. State Rep. Bruce Franks, who has participated in the protests, stressed on Saturday that those who are violent and vandalizing "are not protesters," but a group separate from those marching is organized demonstrations. (G-Jun Yam for ABC News) A woman joins demonstrators outside the St. Louis Justice Center following multiple arrests, Sept. 17, protesting the acquittal of former St. Louis police officer Jason Stockley, Sept. 18, 2017, in St. Louis, Mo. 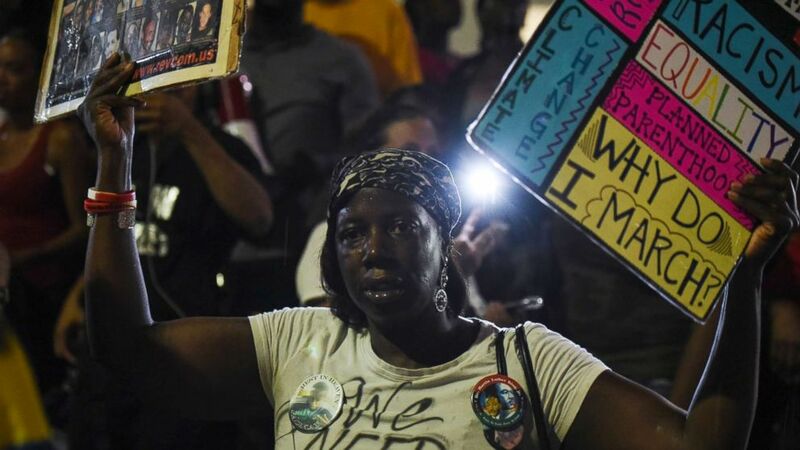 Sunday's crowd began protesting silently in the late afternoon in front of the police department building, then chanted "stop killing us" as officers looked on from headquarters windows, according to The Associated Press. Afterward, they resumed large-scale marching through streets, similar to what they'd done in previous days, chanting slogans such as "this is what democracy looks like," the AP reported.